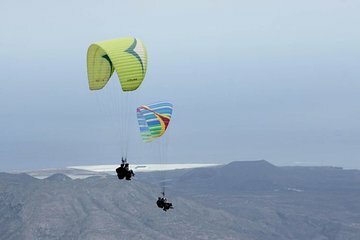 Take to the skies—and discover spectacular views of Tenerife that most travelers miss—on this beginner-friendly paragliding excursion. Following pickup from your area accommodation, travel via air-conditioned vehicle to the paragliding center. After getting acquainted with the gear and techniques, head to either Taucho or Ifonche (two of the island’s best paragliding locales) and take to the skies in the company of the 2018 Spanish Paragliding Champion. From the air, take in views of Tenerife’s volcanic scenery and coastal beauty. Use of paragliding harness and helmet.